Gracing a magazine cover alongside Scarlett Johansson and Deepika Padukone - has Angelababy made it to the global scene? The Chinese actress was recently featured as one of the world's 14 most famous actresses in Vogue's April issue titled 'A celebration of global talent'. But should she represent China on this list? Weibo users don't seem to think so. Despite her immense popularity online, the 30-year-old has been criticised for her rather lacklustre onscreen performances. She's acted in numerous Chinese movies and dramas, but the work she's most well-known for in her country is, unfortunately, reality show Running Man. Even her husband (and fellow actor) Huang Xiaoming admitted that her acting skills could use some improvement. Ouch. 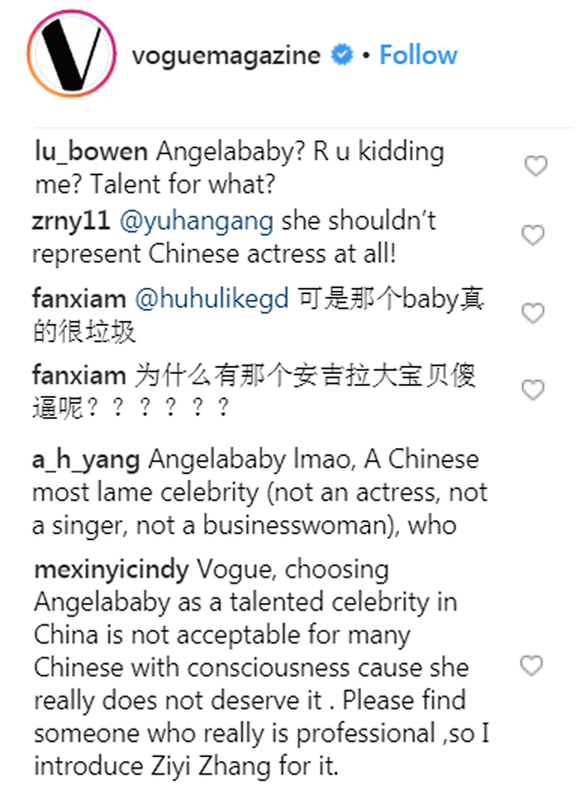 Dubbed the 'Kim Kardashian West of China' by Vogue, Angelababy is China's commercial darling with a massive online following (7 million on Instagram, 98 million on Weibo). Although she's not recognised for her acting, Angelababy's modelling and great fashion sense made her a good choice for the fashion magazine, fans said. So, who should've made the Vogue cover alongside these Hollywood and Bollywood superstars? Fan Bingbing would be the most likely candidate, if she wasn't embroiled in a tax evasion scandal, Weibo users said. Other Chinese actresses that made their list included Sun Li and Tang Wei.